Home / My life / Another Fairytale ? Ananya's Fairytale ?? Another Fairytale ? Ananya's Fairytale ?? I was 14, during school vacations I visited my aunt (my mothers younger sister), who stayed in Pune. We both were watching a romantic Bollywood movie 'Hum Aapke Hain Kaun'. I was totally lost enjoying the romance between Salman Khan and Madhuri Dixit. I was immersed in watching the actor's display of his unconditional love. The way he wooed his lady was so alluring. Reading my mind, my aunt paused the movie and said "Movies are meant for entertainment, don't take these love stories too seriously. Real life is totally different from REEL life. In Reality life is not always rosy, Lovers are not always in Love. There will be a stage where you feel you are in love, but you need to be wise enough to analyze the situation logically and decide whats best for you." "You won't understand completely what I just said, but always remember it", saying this she resumed the movie. That night I lay in my bed thinking if love is real, after hearing the harsh reality of love I decided to always listen to my mind over heart, I promised myself to always think before I act but a small part of me secretly prayed to find my Prince Charming some day. Would my love story end with a ' ..they lived happily ever after', Another Fairytale or will it be a Nightmare, that only time could tell. Dream about the Prince Charming..No Harm in dreaming! And there are many happily ever after true stories out there too..But yes you should always use the right combination of heart and brains :) Lovely write up! Ooooo, my first A to read! And a good one... I think your aunt gave good advice, but it would have been fun to have another aunt who said to follow your heart... then you would have both voices is your head to balance each other. So, are we going to hear the fairy tale? Yes but some advices we do take right?? Yes, that's great advice from your aunt. Thank you ! Love the way you described my inner thoughts. 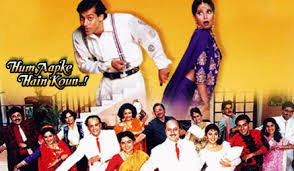 Hopefully your life won't turn out like the soap opera that's HAHK :) Here's to strokes of your life as you make it! My husband and I met online, so we fell in love with who we thought the other one was. We were neither totally the same or totally different than we seemed, though. And we met 21 years ago, have been together 19 years and married for 17 with 3 children. Great A to Z start, Ananya! Yes she discussed a lot of things with me. She was my favorite and I was her's. Life is a fairy tale if we make it one. Always have hope. Cheers for a happy ending! Yes, I am grateful ! hmmm... Dil tho Pagal hai... Dewanna hai ! I was a romantic when I was younger. I loved romantic movies and dreamed I was the heroine. Of course life is a mix of both, a little bit of fairy tale, a little bit of reality....but probably more of the latter! still I think it's wonderful to hope and dream. Yes thats true, Life's a mix. Thank you ! Thank you ! Amrit in reality, it was a long advice she gave me. I cut it, to keep the post short. good things come to those who believe in it. Continue believing in your dream, it will come true. So true but I I realised it only after I was done with all the falling in love and everything :). Looking fwd to the rest of your posts. Yes Sunila, Sometimes we fall in love with a person expecting him to be someone he is not. Sounds like you have a wise aunt, but don't give up on love. Well you know it proceeded, as any other ordinary life story, with extraordinary events. This is wonderful! Yes, you must listen to your brain - there are many charmers that will take what they can and go, but that being said, true love does exist. I see it every day when I look at my husband. Sometimes it can be covered with anger and sadness when we get into a disagreement, but when it comes down to it, the love that we share (going on 11 years married, 18 years since we started dating) grows deeper every day. We rarely let a day go past that we do not say we love each other or share a glance that says more than words. It is wonderful and all logic says that this could not have happened when we were 17, but so far, logic was wrong. My advice is become best friends before you get married, because the friendship holds you through the tough times! Thank you so much for sharing your fairytale with us. Expressing love each day is so important. I value your advice, its true. "Happily Ever After" is a bit idealistic, but you can certainly be fortunate enough to meet the one person who is right for you and spend your lives together. I did! :) We've had some bad times along with the good, but that's just part of life. As someone else said, if you become best friends first, that helps a lot. Yes Debbie. Sometimes I feel whole fairytale concept is overrated. I appreciate your honesty in saying that we have bad times, yes we all do! Nice how you always end your posts with open questions. Moral of the story is - aunties are wrong companies to watch romantic movies with. :-) Ananya, I wish you get the outcome you want! All good things to you! I love Bollywood movies! Anything I can find on Netflix. Do you think it would have been different if the first movie you watched was Devdas? Wisely said, both to your aunt and you. It is in fact true that Real Life is entirely different than the Reel Life, especially when Love is concerned.